The key to this recipe is the butter. You MUST use butter for the proper texture and taste. These turn out very crispy, so if you like softer cookies, you could use a veggie oil instead, but the recipe is for “Crispy” cookies, so stick with butter if you want them crispy. 1/2 cup chopped nuts…your choice! Preheat oven to 350° F and line cookie sheets with parchment paper. In a medium bowl sift together flour, baking powder, baking soda and salt. Set aside. In a large bowl beat canna butter and both sugars with an electric mixer. Add the egg and vanilla and continue to beat until creamy. Add the flour mixture and mix until incorporated. Stir in chocolate chips. Drop by teaspoons onto lined cookie sheets and bake for 12-15 minutes or until the edges start to brown. The baking powder prevents the cookies from browning too quickly allowing them to bake longer and become crunchier without burning. Cool on a cooling rack and enjoy! But, don’t overdo it! 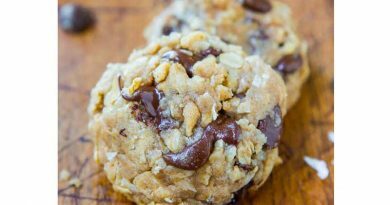 Eat 1/2-1 whole cookie and give it a couple hours before consuming more even though they are DELISH! Warning: Medical cannabis consumption can be unpredictable. Always start with a quarter serving and give it time. Effects can take up to an hour, and sometimes longer. If you have ANY doubts, you should contact a cannabis clinician about dosage. Nice and informative recipe. As you said we can use veggie oil and butter, but for health conscious people is there anything fat-free which you can suggest? I always use to purchase fat free desserts like cakes, cookies, brownies from the website http://www.loveandquiches.com. I would like to request you to share such more recipes related to these types of desserts. Carol, I would suggest “Fat-Free” is not necessarily healthy, first off. Sugars and simple carbs are not healthy, either, so its a give and take. What I suggest to folks that are dosing cannabis in any edible with no fat or oil (or at least no oil to use as a transfer vehicle) is to use kief, or “cannabis flour”. Kief can range from 20% THC to as high as 50 or 60% THC, so dose accordingly. Also, decarboxylate the kief at 200-225 degrees (Warm) in the oven for about 20 minutes, then add to the recipe when coooled. This will make sure its completely activated by the time the cookies are done. As for a recipe with no fat for cookies? I will have to do some research! I know there are Paleo and vegan options, too. – Thanks for the comments!